As far as I can tell, we don’t have a lot of Caribbean choices in Edmonton. So I’ve often considered myself lucky to be only a few minutes away from Irie Foods. Making everything from jerk chicken to beef stew roti, it was actually Sherman’s recent cow foot adventure (here) in Vancouver, that had me inspired to head back and rehash my memories. The restaurant isn’t much too look at, and with only a few tables, it doesn’t seem like a place that welcomes people to stay. 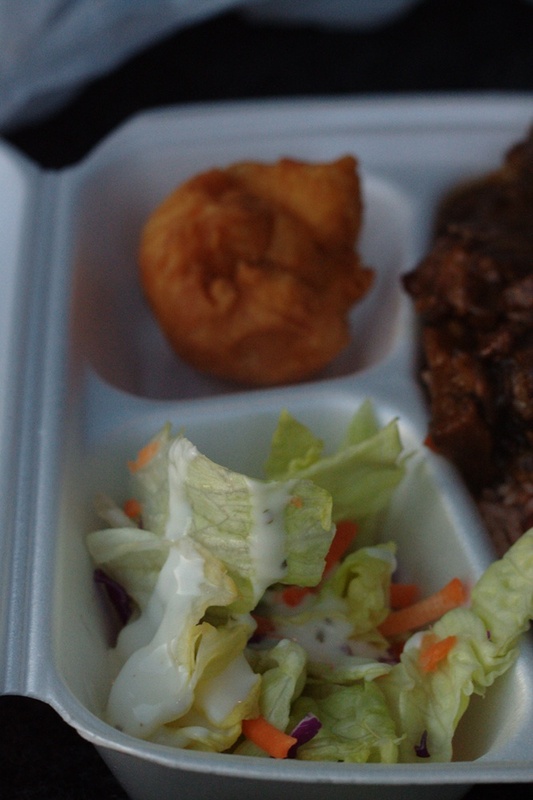 Getting take out is definitely the most common way people experience Irie Foods. During my visits there’s always a steady flow of take out business, and it was no different on this occasion. Don’t worry if you didn’t call ahead though, you can peruse the additional wares tucked in the counter. I felt better about the $12 price point, when I picked up the package and felt its heft. 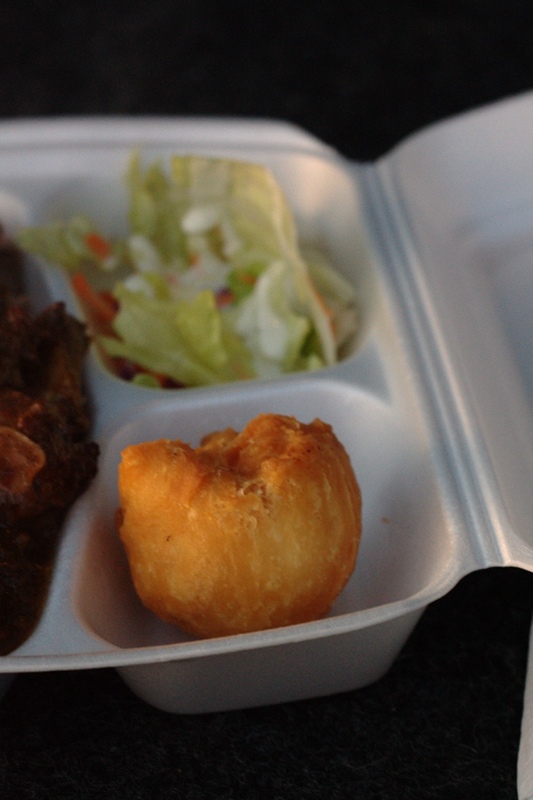 Opening the styrofoam box, I was presented with a steaming mound of oxtail sitting on the rice and peas, a few pieces of bagged salad, and a fried dumpling. First the salad, very much an after thought; the lettuce was crisp, while the ranch sauce was, well..ranch. Ripping the dumpling in half, I felt a few dense sections which were confirmed when I took a bite. The problem with this was that while the outside had great flavour and texture, the interior was tight (think really squished white bread) and made the dumpling unappealing. As a bread man myself, I couldn’t help but think the dough wasn’t allowed to relax enough. Finally the main, and it didn’t disappoint. The oxtail was very tender and deliciously rich. Fantastic! The sauce was well seasoned, and left a growing heat as I worked my way into the dish. The rice and peas (butter beans? ), were cooked perfectly (not hard, not mushy) and did a great job soaking up the sauce while providing a base for the oxtail. I can easily say this is a dish you should try. Don’t worry about the name, or the bones, just dig in! Normally I’d grab a patty, but on this occasion the supplies were low and they were just starting to prepare more. Oh well, maybe on my next visit as I did notice a sign for the $6.99 jerk chicken special, every Wednesday. If you are feeling the need for some Caribbean goodies and you are on the south side, I think Irie Foods is a pretty safe bet. Sure the sides might not be up to par, but that’s not why you come. If for some reason you require a slightly classier setup including proper plate and table service, check out the new Whyte Ave location – 10152 82 Avenue (I can’t confirm the food there).